Lexington's Isaac Murphy Bicycle Club grew out of writer and avid cycler Frank X Walker's vision. The English professor and director of UK's African American and Africana Studies Program wanted to link inner city children to Lexington's Legacy Trail by providing them with bicycles and the equipment needed to enjoy a bike ride. Furthermore, Walker wanted young participants to have access to mentors; mentors would provide training, education and diet guidance to Lexington's youth. "The UK chapter of the Isaac Murphy Bike Club is an outreach program of African American and Africana Studies," Walker said. "The bike club benefits the community by providing and encouraging a wellness activity that strengthens the UK student/faculty/staff family while also serving children in the local community." 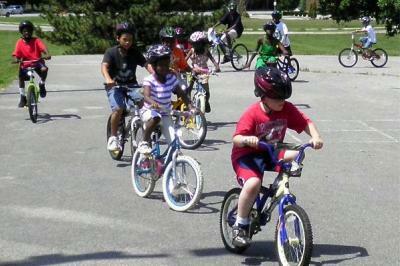 This year, the club hopes to provide 100 children bikes, which amounts to approximately $20,000 in fundraising. There are many ways to donate. The most basic donations begin at a water bottle sponsorship for $10 (a water bottle and bracket) and/or a child’s helmet sponsorship for $40. There are higher levels of sponsorship as well, ranging from the Starting Gate gift, which provides one child with the complete bike kit (bike, lock, helmet, water bottle and safety T-shirt) and costs $200. The highest level of sponsorship is the Triple Crown. At $10,000, a Triple Crown donation provides bicycle kits for 50 children. This level of sponsorship also comes with significant recognition opportunities. "We hope to collect enough new bikes and equipment to organize another bike give away around Christmas," Walker said. The next organized adult ride and membership drive is at 2 p.m. Sunday, Oct. 30. Interested riders are to meet at the trailhead by the Loudon YMCA. New members will be provided with shirts at registration. All members are required to pledge money, volunteer time or donate a gift to the club. UK students, faculty and staff are encouraged to participate. The bike club is always in need of volunteers to participate in bike club activities and to help with staff training events and rides that include children. The club looks to expand in the future and plans to recruit organizations to help sponsor monthly bicycle rides and to coordinate projects that will enrich the surrounding community. The club hopes to construct bike racks that double as public art at William Wells Brown Elementary and Lexington Traditional Middle School. The Isaac Murphy Bicycle Club also hopes to build a new warehouse where bicycle donations can be stored. For more information, please visit http://www.isaacmurphy.org or call (859) 225-3343.